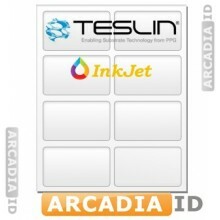 Teslin® Synthetic Paper is the key way to make high quality Id cards using a printer. Teslin® comes in two grades: InkJet Teslin® and Laser Teslin®. 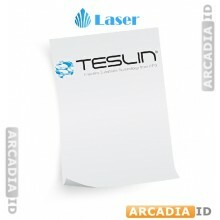 Laser Teslin® TS1000 is designed for use in laser printers. InkJet Teslin® is specially coated for use in InkJet printers. 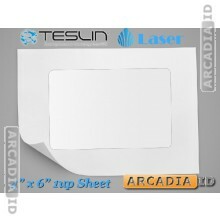 Teslin® paper comes either as full sheets or in perforated sheets with ID cards. The advantage to perforated Teslin® sheets is that ID cards can be easily removed without the need for cutting. Perforated Teslin® paper sheets either come with 1-up or 8-up perforations. 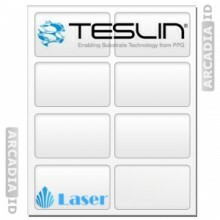 1-up Teslin® sheets eliminate waste if only printing one or two ID cards at a time. It is difficult to reuse 8-up Teslin® sheets because once an insert is removed this sheet may jam in a printer. Teslin® Synthetic Paper is a unique printing sheet that is the key to making PVC card quality ID cards. While Teslin® prints like normal paper, it is actually made out of silica. Teslin® paper;can be printed on with all common desktop printers. Because of Teslin®’s unique properties, it absorbs and binds irreversibly to printed ink, forming a high definition waterproof image that is nearly indestructible. Teslin® paper is water proof, tear resistant, heat resistant, and crinkle resistant. Teslin® also forms an extremely strong bond with our butterfly laminating pouches, producing a borderless card. Lamination of normal paper or cardstock with common laminating pouches require a ¼ inch plastic seam so that water does not seep in or so that it does not delaminate. Teslin® synthetic paper is able to bond tightly to the butterfly pouch, eliminating the need for this seam. Teslin® synthetic paper will not delaminate, and will not absorb water, making it perfect for seamless, edge to edge laminated ID cards which look identical to professionally printed PVC ID cards.